It is most popular in China. Topics: Dial Charges, Broadband, Free Domains, and Free E-commerce. The estimated 304 daily visitors, each view 1.30 pages on average. 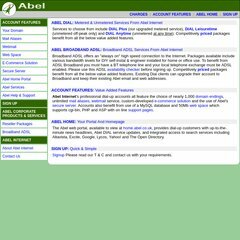 It has 2 DNS records, ns0.abel.net.uk, and ns1.abel.net.uk. It is hosted by Abel Internet (Scotland, Edinburgh,) using Apache web server. Its local IP address is 195.72.113.139. PING www. (195.72.113.139) 56(84) bytes of data.